Welcome to our first Xmas Special! 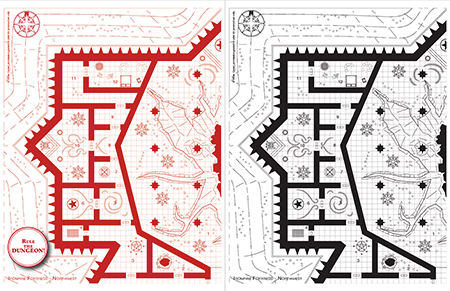 This “red” blueprint provides you the map of a fortress, split in four adjoining pages and with a one-page overview. As a Xmas Gift this product shall be free until 12/25/2015! 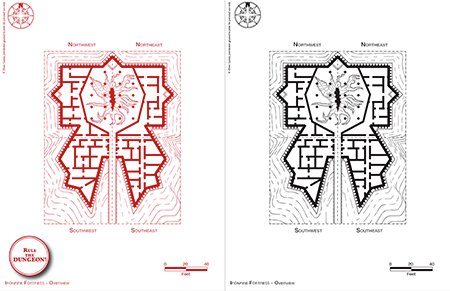 Ironfire Fortress is a demonic fortress feared even across the Nine Hells. Two demon lords, who very often fight each other, inhabit the fortress. Nobody knows the truth behind their conflict, neither for why they continue to coexist in the same place. Someone guesses that the gigantic pit in the middle of the fortress might hide the reason. The Fortress is built atop a lava mount and it is accessible only through a fire-scorched iron bridge. A grand corridor leads directly to the Ironfire Pit, while lateral entrances provide access to the two parts of the fortress.